Every now and again something in the shop crosses my path and instantly I know I want to make something with it. That’s how I felt when I first saw the Deer Skin Lace Leather. It’s so incredibly soft, it was love at first sight. 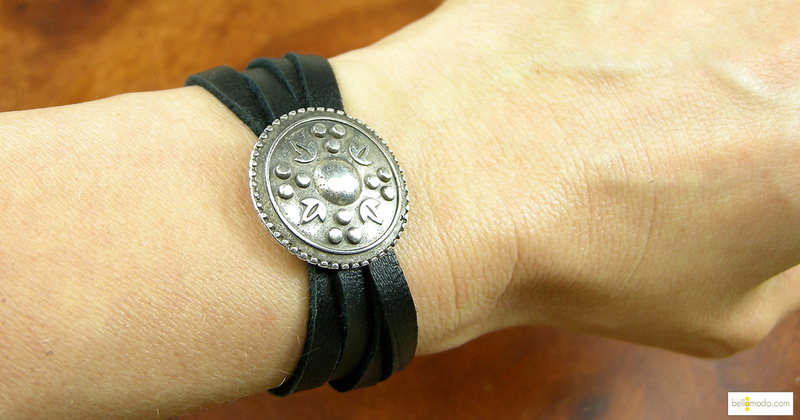 Since it’s pretty thin, I figured a wrap bracelet was the way to go. Then I found these Leaf Shield Sliders and the idea was born. Of course, then I had to figure out how to finish it off and attach it all. I’m glad I ended up making one black and one brown for this tutorial. 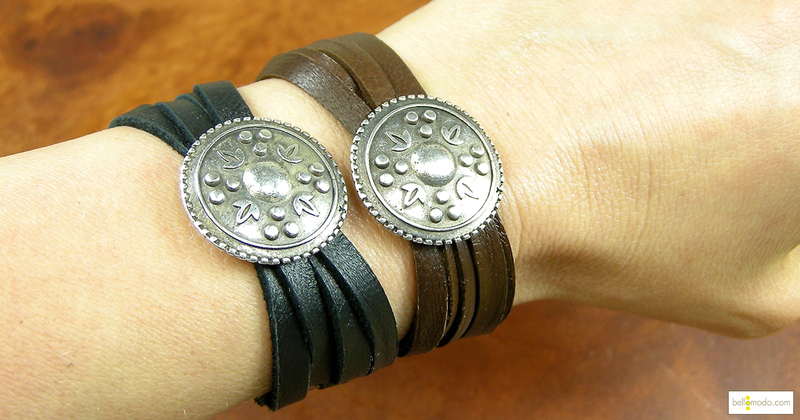 This leather is handmade, which means that there will naturally be slight variations. The black leather is thicker than the brown… so while I was able to get six strands of brown leather through the slider, I could only get four strands of the black. The brown leather is doubled up, so I used one rivet for two strands of leather. This also meant that I needed to use a different end piece as the black was too thick for the Bamboo End Bar Link. I found that the Slotted D-Ring Link worked perfectly for four stands of black leather. I used this awesome leather hole punch to easily make holes in the leather and simply pinched the rivet set together using a pair of flat nose pliers. Since we got the TierraCast You Collection in this week I wanted some of these great, new pieces to be a part of the design. I finished it off with a Mag-Lok Magnetic Clasp because I like being able to put on, and take off, my jewelry quickly and easily. 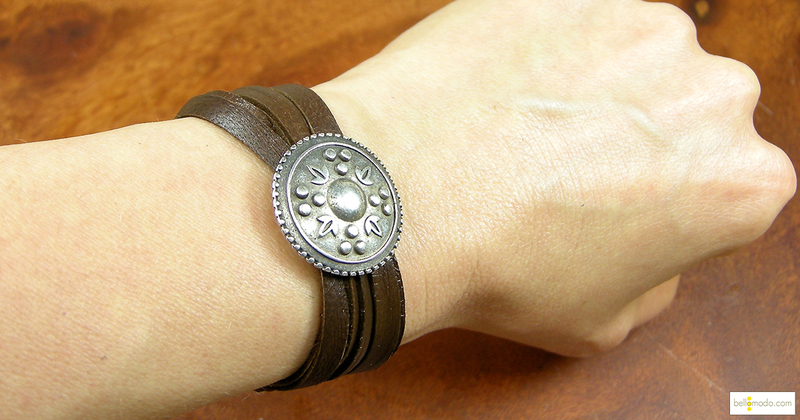 My wrist is pretty small at 6.25 inches, so adjust the instructions to fit your wrist! 6 pieces of Chocolate Brown Deerskin Lace Leather, 6 inches each (sold by the yard). This leather is easily cut by scissors. 4 pieces of Black Deerskin Lace Leather, 6 inches each (sold by the yard). This leather is easily cut by scissors. Cut the leather and slide it through the leaf slider. 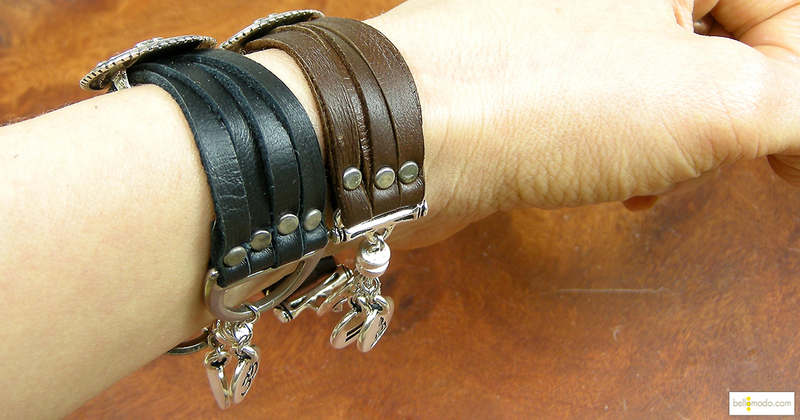 If you are making the brown leather bracelet, stack the six pieces of leather so that you have three strands, in two layers to put through the slider. Working with just one side of the bracelet, thread the leather through the bamboo end bar or the D-Ring, depending on which you are using. Carefully fold over the end of the leather, and punch through both layers (remember that the brown leather will be doubled, so you will do two pieces together, punching through four layers) with the leather hole punch. Insert both the top and bottom pieces of the rivet set and clamp down tightly with a flat nose plier. Repeat step three for all strands of leather on one side. Then repeat steps two and three for the other end of the bracelet. 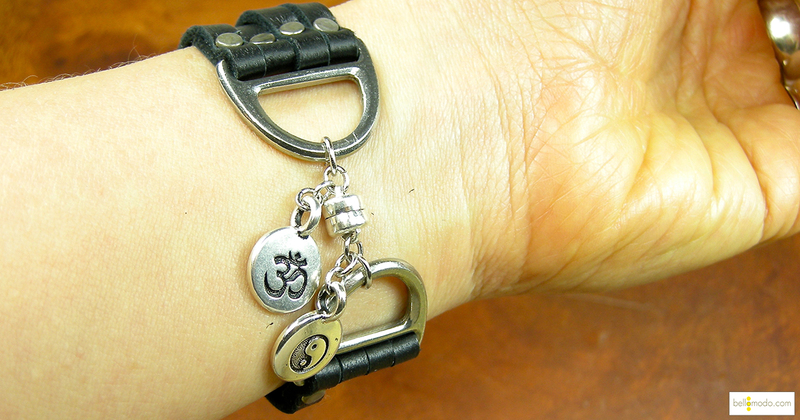 Attach your Mag-Lok magnetic clasp, drops and link (for the brown bracelet) with the jump-rings. 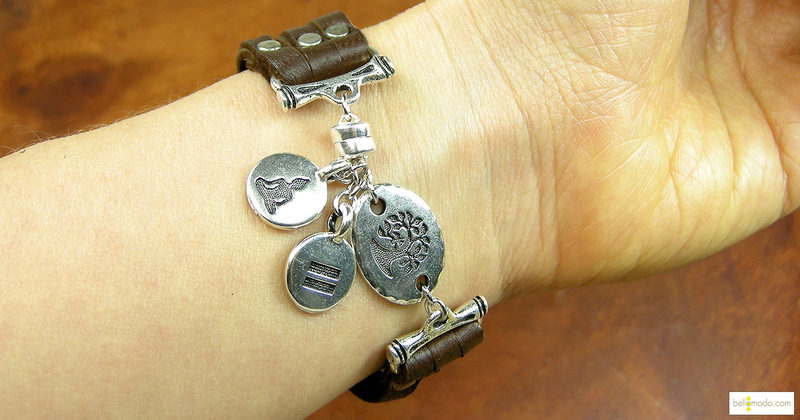 Of course there are tons of other charms, drops and links to choose from: both TierraCast and Nunn Design have a great selection. Pick ones that you like and resonate with you!